If you are looking for a new home construction instead of a re-sale, Bankston Brokers can help you with a new home as well. 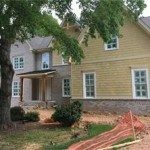 We work with builders in Atlanta to locate lots to build new homes. Depending on the stage of construction, you may be able to take one of our current new homes and choose your own custom finishes, from colors to countertops to flooring to lighting, in order to make it your own. Can’t find the home of your dreams in the community you want to live in? Want to build your own new home, but feel overwhelmed by the process? We can take you through the entire new construction process from finding a lot to building your dream home. Our services include, builder selection, lot selection & acquisition, acquiring a construction loan, assisting with the loan process, selecting title attorneys, and recommending decorators. We will be with you every step of the way. Bankston Brokers can help you build your ideal home so you and your family will love where you live.